Reading and writing are one of the most essential milestones in the life of young children. These are two indispensable developmental skills that influence kids’ ability to communicate and make their way in the world of advanced learning. Basically, without these skills we wouldn’t be able to express ourselves and put our ideas on paper that can be useful to ourselves and other people. Before children learn to read and write properly, they should develop their ability to speak first. Often kids feel so excited about being able to talk and express their thoughts that they can stutter from time to time. It is a natural stage, when kids start developing their verbal language, and it is when parents should become attentive listeners for their little ones, without focusing on their misword, misspeak or stutter. In the Montessori method, language development is supported by a number of activities that stimulate communication skills and vocabulary development. There is a broad range of materials for reading readiness, phonetic analysis as well as fine motor control. Physical skills. Small kids get started with learning sounds and letters through eye-hand work, concentration on practical activities as well as when they touch and recognize materials of various shape and size. Mental skills. Kids make progress in language development, as they get acquainted with sounds that each letter has and divide words into sounds. Social skills. Children can naturally learn the language, when they are included in conversations with family members and peers. The Montessori method focuses on training senses as a prerequisite for the acquisition of reading skills. But before kids get started to work with sensorial materials, they get involved in activities that develop their motor skills such as washing dishes, polishing or brushing clothes. The fact is that fine motor activities improve small muscle movements, which enable us to reproduce letters and numbers using our hands and fingers. When children work with sensorial materials, they develop senses for perceiving the sounds of various things. According to the Montessori approach, writing should precede reading. As children learn to write “phonetically”, they start with sounds that form a basis for reading. Later on, a child is able to relate phonetic sounds to specific letters. In the Montessori classroom, kids learn to form words by picking up colorful paper letters from the Montessori alphabet and putting them on the table. They are encouraged to write whatever they want, even if they misuse letters. As they progress, they will write more correctly even without noticing it. The main aim at an early stage of literacy learning is to make kids able to express their thoughts in the written form, not master spelling or grammar rules. In the Montessori environment, real experience goes before vocabulary. In such context, Montessori teachers present to kids real actions before verb cards, real nature before pictures with natural landscape, real music piece of music before cards with music instruments and famous composers. Thus, kids can deal with real objects and then learn their names. In such a way, children can grasp connection between the language and the real world. The basis for reading is formed, when a child sees people around them reading and doing it with pleasure. Children love to be talked to and listen to stories. Reading aloud to children can help them explore new facts, acquire the right word pronunciation as well as get introduced to vocabulary that not always come up in day-to-day conversations. Storytelling is a good way to instill lifelong love of books and reading on their own. In the Montessori approach, kids are introduced to sounds of the letters before they get to know the names of these letters. Sandpaper Letters are the letters of the alphabet presented in small pieces of sandpaper. Children first learn to write letters separately and then combine various letters into words. The main objective of this Montessori material is to help kids memorize and recognize the sound and size of various letters. 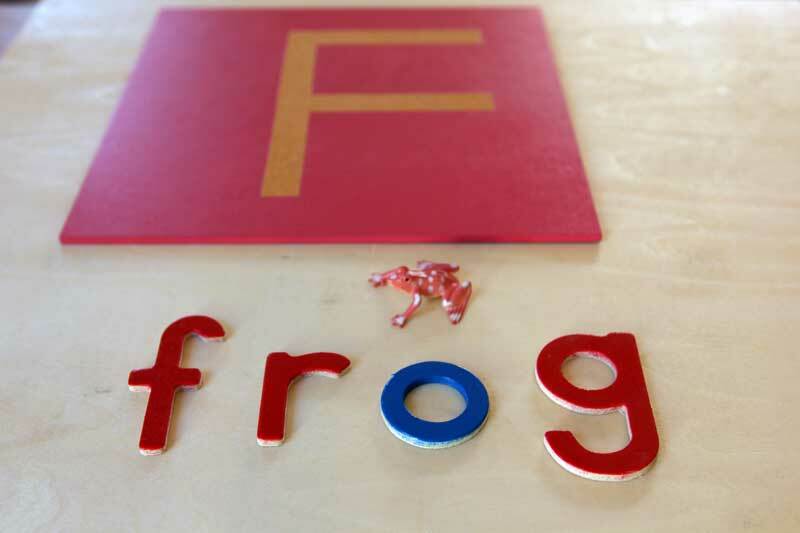 Montessori movable alphabet provides kids with outstanding sensorial experience. Children can hold letters in their hands, feel their shape and manipulate them while constructing words. Some variants of the Montessori alphabet are provided with picture cards – a child is expected to make up a word from the picture and pronounce the sound of each letter. Some picture cards are to be clipped on a special board, which stimulates development of fine motor skills and hand muscles necessary for writing. Such materials are based on matching objects and cards. A kid is expected to recognize the object and find the match. As a rule, card pictures can be grouped by topic and illustrate some basic objects/words that a child will certainly know. This is a box of words written on separate pieces of paper and kept folded. Children take cards with a “silent words” from the box, read them to themselves and fold them back up. Such materials are designed to introduce kids to silent reading. It is a small box with verb and noun cards presented to children in a playful manner. Kids are excited to participate in such a game-like activity, as they can both learn and play. When a child takes a verb card, he/she is expected to perform an action and others should guess what verb has been shown. If a kid takes a noun card, he/she should find the right object in the classroom and place a card on it as a label. Such Montessori materials for literacy learning are indispensable components of the Montessori environment. They help kids consistently make steps towards independent reading and writing and add excitement to this complex process. To sum it up, Montessori supportive environment provides kids with necessary facilities to acquire reading and writing skills naturally. Montessori classroom is a reading-friendly environment, where kids are encouraged to work independently to master sounds, letters and words. Apart from reading as such, special attention is paid to reading activities referred to geography, history and some other topics, reflecting kids’ specific interest.